Amazing what some people will steal. Well, not really people but scum bags!! 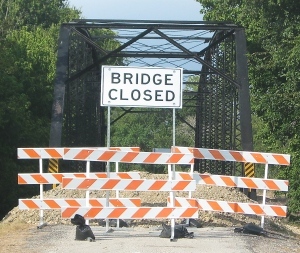 Sometime after late last Thursday (Apr 23) evening and Saturday (Apr 25) morning, low life thieves dismantled and made off with about half the lower guard rails on the northside of the historic (and closed) CR 456 Brushy Creek Bridge. The theft was reported to the Williamson County Sheriff’s office on Sunday (Apr 26). No more of the 103 year old railing was observed to be stolen until this evening (Apr 29) when it was noted that ALL THE RAILING on the north half of the bridge has been stolen. This continued theft of the guard rail was also reported to the County sheriff this evening (Apr 29), but short of stationing an officer 24/7 at the bridge, it is unlikely the thieves will be apprehended. Not only is this a theft of County property, it is a theft of property belonging to the tax paying public of Williamson County and it is also severely defacing a rare and historic monument to an earlier time. With no guard railing on the sides of the bridge, the bridge now constitutes a real and present dangerous safety hazard … there is nothing to prevent someone from falling from the bridge onto the steep bank below or, worse yet, falling the 25 feet down into the flowing creek. And that probably puts it into the category of an attractive nuisance making the County (and indirectly the County taxpayers) liable for any harm that should happen to anyone falling from the bridge. So, be aware that if you take or know of someone who takes small children onto the bridge for whatever reason, they are in a greatly increased risk of falling off the bridge. And grown-ups are equally at risk of unintentionally falling from the bridge. If you happen to have any information regarding the theft of these historic bridge railings, please contact the Williamson County Sheriff’s Office at 512-943-1365. This entry was posted in Breaking News, Crime Reports, What's New? and tagged 100 Polzin St Coupland Texas, Brushy Creek Bridge on April 29, 2015 by Stewart Dale Spencer. This makes me very sad. I grew up just a short way from this bridge. 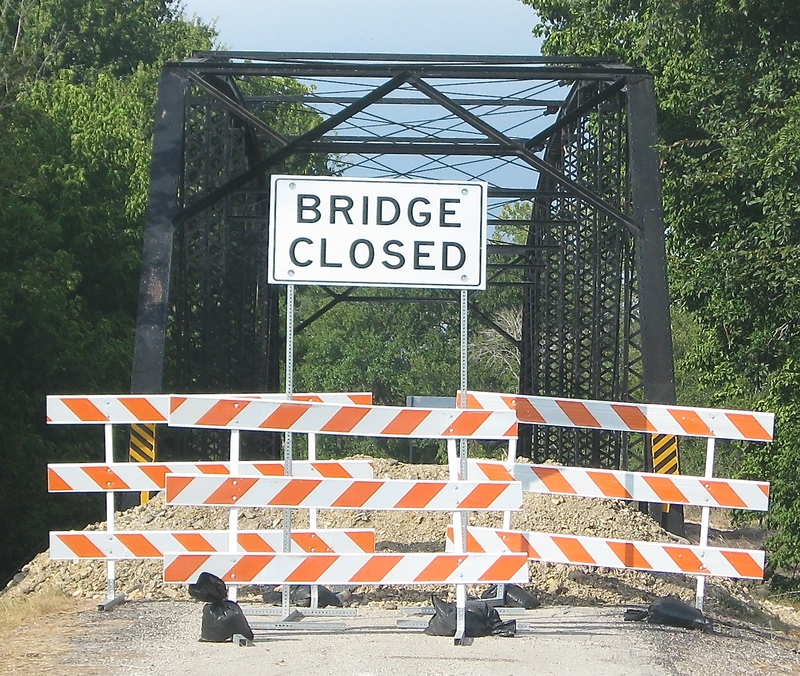 Now that the bridge is a danger tithe public, theCounty now has justification to tear it down. It would be a lot cheaper to put up temporary railing, perhaps chains or cables, than to tear the bridge down. Attend the next city council meeting and urge the council to put pressure on the county and the state to move more quickly on repairs.